Bath rugby head coach Mike Ford says he is unsurprised the club's forwards coach Neal Hatley is being linked to a role with England. New England boss Eddie Jones is in the process of recruiting his backroom staff, with Hatley linked to a role as scrum coach. "Our scrum is one of the best in Europe," Ford told BBC Points West. "So no, it does not surprise me he is being linked with an international position." 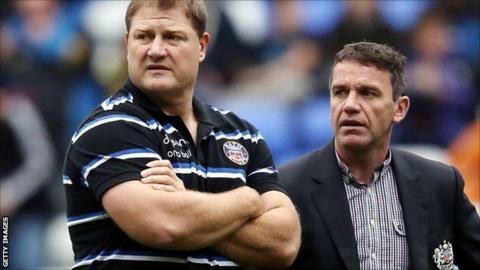 Under Hatley's guidance, Bath's scrum has become one of the most feared in the Premiership, with the club also reaching the domestic final last season. "I think the proof is in the pudding and he has been outstanding," added Ford. "We all know how much work he does on scrum analysis and he finds ways of making them a better scrumager." "I think I've got great experience of being an assistant coach with England and it's not necessarily the next step," he said. "Neal is also in charge of our defence and is developing here and his ultimate ambition is to be head coach of an organisation somewhere down the line. "So you have to be careful that if you go back to being a specialist coach for only 10 games a year, it's not necessarily the best step for you."